A thorough understanding of salivary gland anatomy is important for successful sialendoscopy. The parotid gland is the largest of the salivary glands and is found over the mandibular ramus just anterior to the ear canal. The parotid duct is named Stensen’s duct. The duct lies 1.5cm inferior to the zygomatic arch and runs parallel to it. It travels superficial to masseter muscle and then pierces the buccinator before entering the oral cavity. The papilla of the duct can be found in the oral cavity at the second maxillary molar. The duct is about 4-6cm long with a diameter averaging 0.5-1.4mm. The papilla is the narrowest portion of the duct however the masseteric bend can prove challenging to navigate during sialendoscopy. The parotid duct is on an average about 3 mm in diameter. In terms of access, it is the easier duct to cannulate but more difficult to navigate. The unique challenges working with the parotid duct are the likelihood of salivary leak into the cheek or masseteric space in the event of duct perforation and proximity to the buccal divisions of the facial nerve. Stones and strictures anterior to the masseter can be approached transorally and those posterior to the anterior border will require an external parotid approach is a combined (endoscopic and open) procedure is being contemplated. The submandibular gland lies inferior to the floor of mouth extending into the submandibular triangle of the neck. The submandibular duct is named Wharton’s duct. It averages 5cm in length and 0.5-1.5mm in diameter. The duct starts at the medial gland and runs between the mylohyoid and hyoglossus muscles. The duct enters the oral cavity at the floor of mouth just lateral to the lingual frenulum. 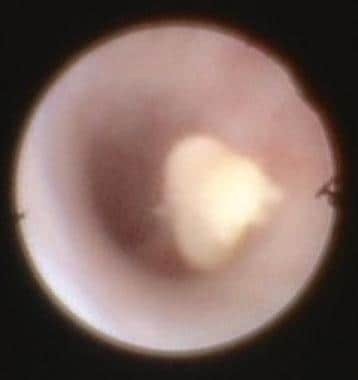 The path of the duct is more direct than Stensen’s however the papilla can be narrow and challenging to cannulate; consequently the Wharton's duct is difficulty to enter but easier to navigate. 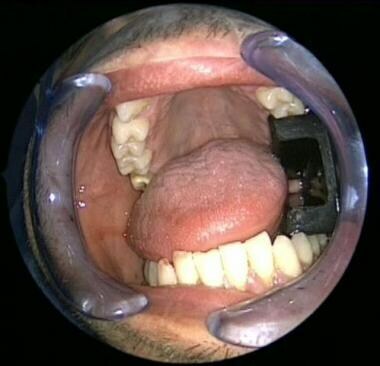 The unique challenge with the submandibular ductal system include its relation to the the sublingual gland and duct; injury to either during sialodochotomy can increase the likelihood of developing floor mouth and plunging ranulas. Also, the proximity of the lingual nerve to the duct as it crosses from a lateral position posteriorly, below the nerve to a more medial position to the duct anteriorly must be borne in mind to reduce traction and direct injury to the duct during complex stone removal and combined technique; injury to the lingual nerve can lead to temporary or permanent taste disturbance and loss of sensation to the anterior 2/3 of the tongue on the side of the injury. Patients with lingual nerve paresis or palsy report metallic taste in the mouth or tongue numbness. Ultrasonography of the salivary glands has gained popularity because it is noninvasive, repeatable, and offers excellent definition of the salivary gland, detecting stones 1.5 mm or greater in size with 95-99.5% sensitivity. Limitations of ultrasonography include limited assessment of the deep portion of the submandibular gland and portion of the parotid gland behind the mandible. In addition, its value is highly operator dependent. Computed tomography (CT) can be used to identify the location, diameter, and orientation of the calculi. Limitations of both CT and ultrasonography include distinguishing stones not visible or detectable on imaging from stenosis, owing to the diameter of the duct distal to the obstruction. 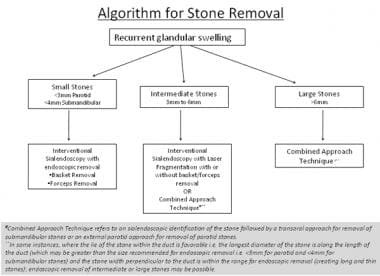 Algorithm depicting management of recurrent glandular swelling caused by salivary stones. Management is based on stone size: small, intermediate, or large. The only contraindication for sialendoscopy is acute sialadenitis. Although this condition is not an absolute contraindication, it makes sialendoscopy problematic because an inflamed ductal system is more difficult to dilate. In addition, use of the rigid dilator system, a semirigid endoscope, or both during an acute episode of sialadenitis increases the chance of ductal trauma and potentially fosters the spread of infection in the soft tissues of the head and neck. When the stones are very large or when preoperative assessment suggests that endoscopic removal will be difficult, the authors have successfully employed the combined approach described by Marchal. 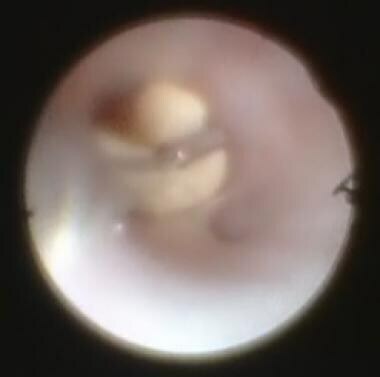 This technique involves localization of the stone in the ductal system by means of sialendoscopy. Exploration of the duct is guided by the illumination of the sialendoscope. In submandibular cases, the exploration requires an intraoral incision. In parotid cases, a partial or complete parotidectomy incision and elevation of a superficial musculoaponeurotic system (SMAS) flap may be necessary to deliver the stone. This is followed by surgical repair of the duct and placement of a stent under endoscopic visualization. In a retrospective analysis of 56 sialendoscopy cases, no instances of facial nerve paralysis or hemorrhage were reported. Additionally, the authors found that major complications (defined as iatrogenic insults directly responsible for additional procedures) occurred in only 2% of cases and that minor complications (defined as any adverse event leading to either failure of the procedure, a second surgical procedure, a change in the surgical plan, or deviation from the planned course of events as a result of the procedure itself) occurred in 23%. Noncontrast computed tomography (CT) is commonly used for preoperative evaluation of patients who are being considered for interventional sialendoscopy  ; other imaging modalities can be used as well. 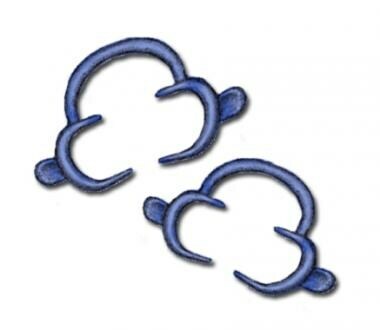 A complete head and neck examination and an otolaryngology evaluation are recommended before the procedure. Features relevant to successful sialendoscopy should be assessed and documented, including the location of the papilla, the patency of the duct with or without salivary flow, the consistency and clarity of the saliva, any asymmetry or enlargement of the involved glands, the bimanual palpability of the gland, and the palpability and position of the stone. In addition, the surgeon must evaluate the accessibility of the oral cavity by paying close attention to the size of the oral commissure (eg, microstomia) and the tongue, the ability to open the mouth (eg, preoperative trismus), any pathology of temporomandibular joints, and the presence or absence of mandibular tori. In addition, assessment of the nasal septum and upper airway helps the anesthesia team prepare for nasotracheal intubation, which is the preferred method for achieving maximal exposure. 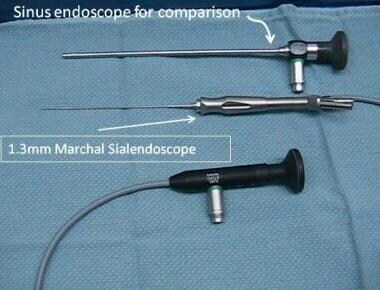 Comparison of 1.3-mm Marchal sialendoscope with standard 4-mm sinus endoscope. Marchal Dilator System includes set of dilators of increasing diameter from smallest (No. 0000) to largest (No. 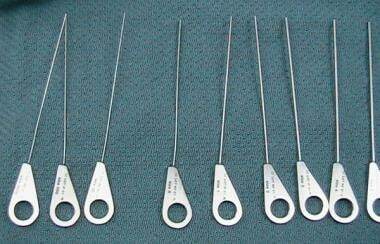 6), used for graded dilation of salivary duct papilla. Sialendoscopy can be performed in the office setting with either local anesthesia alone or local anesthesia plus sedation. However, because of the discomfort some patients may experience, surgeons' preferences, and the indications for sialendoscopy, it is most commonly performed in the operating room (OR), where either general anesthesia or local anesthesia with sedation may be used. If general anesthesia is to be used, the surgeon should consult preoperatively or perioperatively with the anesthesia team regarding the positioning of the patient, as well as the placement, fixation, and route of insertion of an endotracheal tube (transnasal or transoral). The anesthesia team should absolutely avoid the use of anticholinergic medications before and during the procedure. In general, nasotracheal intubation is preferred when possible because it allows optimal exposure of the openings of all major salivary glands. Patient positioning for sialendoscopy is similar to that for routine endoscopic sinus surgery. The patient’s mouth is kept open with a retractor, bite block, or dental splint. A disposable cheek retractor is often helpful to keep the cheek mucosa retracted (see the images below). 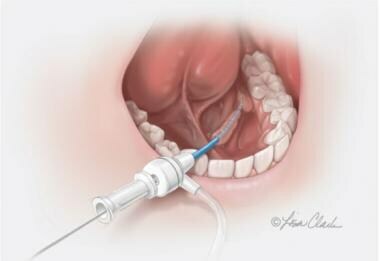 Illustration shows disposable plastic cheek retractor that is self-retaining and allows retraction of buccal mucosa. This retractor is especially useful for edentulous patients and often reduces need for additional assistant. Disposable cheek retractor is in place, retracting lateral buccal mucosa and soft tissue. Dental splint placed between teeth provides adequate mouth opening for access to papilla. The procedure requires a single assistant to perform all the perioperative maneuvers. In some instances, sialendoscopy may be combined with a surgical approach (transoral or an open external) to manage large or impacted salivary stones or strictures. [7, 18] For this combined approach, additional assistants may be required to provide exposure. Antibiotic prophylaxis may be administered in the immediate perioperative period. However, some practitioners advocate antibiotic coverage for 1 week postoperatively, especially if the case was difficult, if complications develop, or if an indwelling stent is present. The patient is instructed to massage the gland frequently to promote expression of collected secretions and residual debris. Postoperative swelling is normal for the first 48 hours but may last for 3-5 days after the procedure. In normal anatomy, the success rate for cannulating the salivary duct is greater than 95%. [26, 27] In a study by Nahlieli et al, the overall rate of immediate failure (in which introduction of the endoscope into the gland was not possible) was 1.1% (0.8% in the submandibular gland, 0.3% in the parotid gland). The overall diameter of the parotid duct is about 1 mm smaller than the diameter of the Wharton duct (approximately 2-3 mm). Consequently, navigating the parotid duct requires more dexterity. In addition, the parotid duct turns sharply over the anterior border of the masseter. 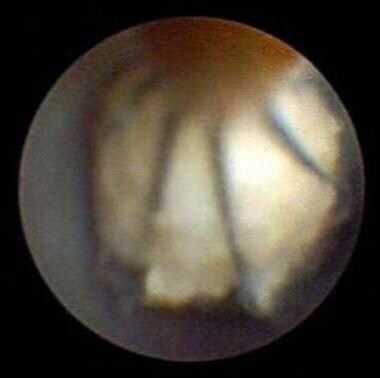 Both the smaller ductal diameter and the presence of the masseteric bend can lead to impaction of smaller stones being impacted and may prevent advancement of the scope. In this situation, manipulation of the cheek often reduces the acute bend in the Stensen duct around the masseter muscle, allowing further advancement of the sialendoscope. Sialendoscopy is performed as follows. The most challenging portion of the procedure is identifying and cannulating the papilla in an atraumatic fashion. Identification of the papilla is facilitated by using magnification in the form of a microscope or surgical loupes. In addition, massage of the gland to express saliva helps localize the papilla. Identification of the papilla may also be facilitated by application of methylene blue to the area and then washing it out to allow the papilla to be highlighted as concentrates the methylene blue. Once the ductal opening is identified, injection of 2 mL of lidocaine with epinephrine in its periphery makes the opening more prominent and stiffens the tissue, thereby facilitating manipulation, which is more important in submandibular sialendoscopy. However, this is not a mandatory step and should be used per surgeon's discretion. 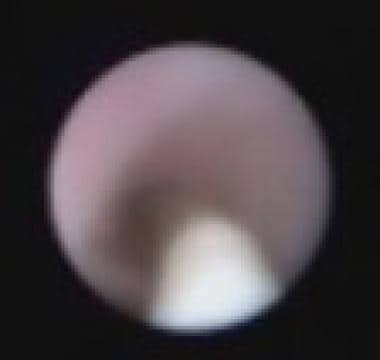 The most important pearl is to try to avoid holding the floor of mouth mucosa with toothed forceps and using a "no-touch" dilation technique (ie, using non-traumatic instruments such as digital retraction or Q-tips to help manipulate the papilla). Salivary duct probes of increasing diameter are inserted to achieve progressive dilation of the salivary duct and thereby allow the introduction of the sialendoscope. Alternatively, the papilla and duct may be dilated by means of the Seldinger technique (see below). Nahlieli et al have suggested performing a papillotomy to allow introduction of the scope. In the authors' experience, however, papillotomy prevents the creation of a mucosal seal around the endoscope, resulting in leakage of the irrigant, which may prevent maximum dilation of the duct by exerting hydraulic pressure. The authors reserve the use of a papillotomy for 2 scenarios: (1) difficult cases in which standard dilation or the Seldinger technique fails and (2) delivery of larger stones at the end of a procedure (small papillotomy). Although the most important use of the salivary probes is to dilate the proximal portion of the salivary ducts, the natural tendency is to insert the probe as far into the duct as possible. This tendency must be resisted because inserting the probe too far may displace the sialolith proximally or result in inadvertent ductal wall injury and the creation of a false passage. Accordingly, the probes must not be inserted more than 1.5 cm beyond the ductal opening. Similarly, larger probes are introduced only if it is possible to do so in an atraumatic fashion. If a larger probe does not pass easily, it may be necessary to return to the next smaller size and perform further dilation with that probe before continuing. As an alternative, it may be helpful to use a lacrimal conical dilator as an interim dilator after passing the No. 3 probe before proceeding to a larger probe. Careful dilation is critical because excessive force may lead to ductal perforation and the creation of a false passage. Saliva around the papilla can be dabbed gently with cotton swabs or Q-tips. Suction tips may be traumatic and cause edema of the tissues around the papilla, obscuring the opening of the duct. If standard dilation fails or cannot be used for some other reason, the Seldinger technique may be attempted. In the Seldinger technique, a guide wire is placed through the papilla and into the duct after passage of the No. 0000 salivary probe. The guide wire is made of titanium and is of a diameter equal to that of the No. 0000 probe. 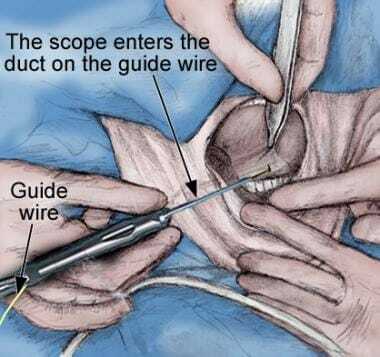 Once the guide wire is in place, the duct is dilated with a 2.5-mm Marchal bougie that has a central channel that accepts the guide wire (see the images below). The dilation is performed very slowly by gently turning the bougie around the guide wire and allowing sufficient time for the duct to expand. 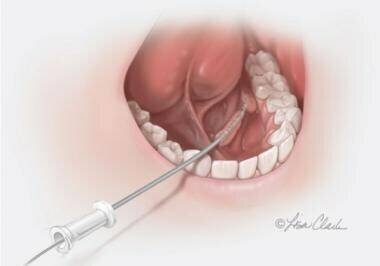 Illustration depicts Seldinger technique for dilation of papilla. Guide wire is threaded into submandibular papilla. 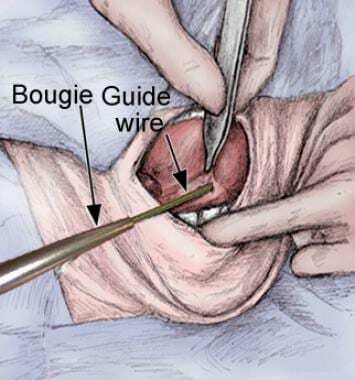 Once guide wire is in place, bougies of increasing diameter are threaded onto it and rotated very carefully and slowly to dilate papilla sufficiently to allow introduction of sialendoscope. Toothed forceps can provide measured traction and stability to facilitate introduction of guide wire and bougies. Once papilla is dilated with Seldinger technique, there are 2 options for introduction of scope. First involves removal of guide wire followed by introduction of scope. Second, as illustrated, involves threading scope onto guide wire and then inserted it into duct. This latter technique allows more controlled entry of scope into duct. Another option for the Seldinger technique is the Cook Dilator System and the Kolenda Introducer Set. This is a series of disposable dilators graded from No. 4 to No. 7 that are passed over a guide wire. 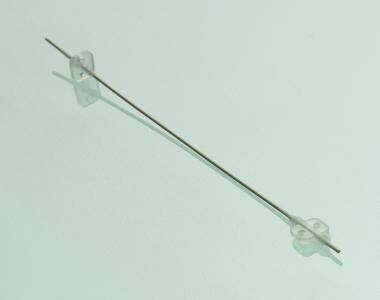 The guide wire has a flexible tip that allows atraumatic advancement of the guidewire in the ductal system. After successful dilation of the papilla, the Kolenda Introducer Sheath is passed over the guide wire in order to create a working channel and protect the ductal wall from inserting and removing instruments. See the images below. Cook Dilator System and Kolenda Introducer Set. ©2011 Lisa Clark courtesy of Cook Medical, Inc. Potential complications of the Seldinger technique include ductal perforation and distal displacement of the sialolith by the guide wire. Once dilation of the duct opening has been achieved, the sialendoscope is introduced into the duct. The intensity of the light source is set at 30% of maximum strength. In the authors' experience, the 1.3-mm Marchal sialendoscope and the 1.1 mm and 1.6 mm Erlangen all-in-on” scopes (Karl Storz, Tuttlingen, Germany) have been the most useful for this procedure; however, salivary endoscopes with diameters ranging from 0.8 to 1.6 mm are available to facilitate both diagnostic and interventional procedures across all age groups. Because the ductal walls are naturally collapsed, the duct must be dilated and splinted by means of the hydraulic pressure provided by irrigation with normal saline (NS). Irrigation with NS lubricates the lumen, maintains the optical tunnel, and allows advancement of the endoscope into the proximal ductal system. Often, the scope must be moved within the duct in a gentle circular motion to achieve a centered view of the duct. If sialendoscopy is being performed with the patient under sedation and monitored anesthesia care, the duct is initially irrigated with lidocaine 2% (first 10 mL) before being irrigated with NS. Subsequent therapeutic interventions are guided by the pathology present. For sialolithiasis, endoscopic removal of the stones is most commonly performed with the use of a wire basket. Once the stone has been located, the assistant passes the closed wire basket through the working channel of the sialendoscope. The closed basket is advanced past the stone and then opened. Gentle to-and-fro movement of the wire allows the stone to be captured in the basket. Once the stone is manipulated into the wire basket, the basket is closed; the basket with the stone and the scope are then withdrawn together under direct vision (see the image below). The assistant is responsible for withdrawing the wire basket while the surgeon withdraws the sialendoscope. Image shows stone trapped endoscopically in stone wire basket. Stone can then be withdrawn under endoscopic guidance. Stones that are free-floating are more amenable to endoscopic removal. In these situations, a grasping forceps can also be used to remove the stone (see the images below). Shown is 3-mm free-floating stone within submandibular duct. Stone forceps engages 3-mm submandibular duct stone; 1.6-mm all-in-one Erlangen sialendoscope permits placement of stone cup forceps in its interventional channel for endoscopic stone removal. The surgeon should be careful not to pull on a stone that is impacted; doing so may result in avulsion of the duct  or breakage of the basket, which would necessitate an open procedure. With most sialoliths, a small papillotomy is usually performed to facilitate delivery. For larger stones, the combined approach is often useful for stone removal; laser fragmentation can also be employed. Different types of stone fragmentation techniques have been reported with a success rate of about 80%. The most common of these techniques are laser and pneumatic lithotripsy. Ductal dilation is recommended for the management of stenosis proceeds similarly, except that a balloon dilator is used instead of a wire basket (see the images below). Other tools that can be used for dilation include disposable Cook dilators over a guide wire that is passed into the stenosis (however, this is a blind procedure), mechanical dilation using the sialendoscope, and open and close action of stone baskets. Endoscopic view of stenotic ductal segment with placement of endoscopic balloon dilator. Image courtesy of Barry Schaitkin, MD. Endoscopic balloon dilator inflated across stenotic ductal segment. Dilation must be repeated until endoscopic confirmation of dilatation of stenosis can be appreciated. Image courtesy of Barry Schaitkin, MD. In general, sialendoscopy is considered to be a safe outpatient procedure and has been validated as a safe technique in several large studies. However, both major and minor complications are known to occur. Although diagnostic sialendoscopy is possible in most patients, ductal stenosis, inflammation, or the presence of an acute masseteric bend of the parotid duct can make navigation with the scope difficult and may result in failure to pass the scope along the entire ductal system. In addition, it may be difficult to enter the papilla with the sialendoscope, a situation that may be compounded by active inflammation. There are several materials that can be used for stenting the ductal system. Usually stents are placed from 2-4 weeks. The commonly used stents range from 0.6 to 2.o mm in size. Image below shows a 1.0 mm Walvekar Salivary Stent. This double headed stent can be trimmed to be used in the submandibular or parotid duct. The flanges at each end are ergonomically oriented to facilitate anchoring the stent. A single 4-0 nylon loop stitch is recommended to secure the stent in position. A 1-mm Walvekar Salivary Stent. This double-headed stent can be trimmed to be used in the submandibular or parotid duct. The flanges at each end are ergonomically oriented to facilitate anchoring the stent. A single 4-0 nylon loop stitch is recommended to secure the stent in position. Courtesy of Hood Laboratories, Inc.
Marchal F, Dulguerov P. Sialolithiasis management: the state of the art. Arch Otolaryngol Head Neck Surg. 2003 Sep. 129(9):951-6. [Medline]. Witt RL, Iro H, Koch M, McGurk M, Nahlieli O, Zenk J. Minimally invasive options for salivary calculi. Laryngoscope. 2012 Jun. 122(6):1306-11. [Medline]. Becker M, Marchal F, Becker CD, Dulguerov P, Georgakopoulos G, Lehmann W. Sialolithiasis and salivary ductal stenosis: diagnostic accuracy of MR sialography with a three-dimensional extended-phase conjugate-symmetry rapid spin-echo sequence. Radiology. 2000 Nov. 217(2):347-58. [Medline]. Som PM, Shugar JM, Train JS, Biller HF. Manifestations of parotid gland enlargement: radiographic, pathologic, and clinical correlations. Part I: The autoimmune pseudosialectasias. Radiology. 1981 Nov. 141(2):415-9. [Medline]. Zenk J, Koch M, Klintworth N, et al. Sialendoscopy in the diagnosis and treatment of sialolithiasis: a study on more than 1000 patients. Otolaryngol Head Neck Surg. 2012 Nov. 147(5):858-63. [Medline]. Nahlieli O, Nakar LH, Nazarian Y, Turner MD. Sialoendoscopy: a new approach to salivary gland obstructive pathology. J Am Dent Assoc. 2006 Oct. 137(10):1394-400. [Medline]. Marchal F. A combined endoscopic and external approach for extraction of large stones with preservation of parotid and submandibular glands. Laryngoscope. 2007 Feb. 117(2):373-7. [Medline]. Luers JC, Grosheva M, Reifferscheid V, Stenner M, Beutner D. Sialendoscopy for sialolithiasis: Early treatment, better outcome. Head Neck. 2011 Apr 11. [Medline]. Maresh A, Kutler DI, Kacker A. Sialoendoscopy in the diagnosis and management of obstructive sialadenitis. Laryngoscope. 2011 Mar. 121(3):495-500. [Medline]. Walvekar RR, Razfar A, Carrau RL, Schaitkin B. Sialendoscopy and associated complications: a preliminary experience. Laryngoscope. 2008 May. 118(5):776-9. [Medline]. Bomeli SR, Schaitkin B, Carrau RL, Walvekar RR. Interventional sialendoscopy for treatment of radioiodine-induced sialadenitis. Laryngoscope. 2009 May. 119(5):864-7. [Medline]. Kim JW, Han GS, Lee SH, Lee DY, Kim YM. Sialoendoscopic treatment for radioiodine induced sialadenitis. Laryngoscope. 2007 Jan. 117(1):133-6. [Medline]. Vashishta R, Gillespie MB. Salivary endoscopy for idiopathic chronic sialadenitis. Laryngoscope. 2013 May 27. [Medline]. Bodner L. Giant salivary gland calculi: diagnostic imaging and surgical management. Oral Surg Oral Med Oral Pathol Oral Radiol Endod. 2002 Sep. 94(3):320-3. [Medline]. Lustmann J, Regev E, Melamed Y. Sialolithiasis. A survey on 245 patients and a review of the literature. Int J Oral Maxillofac Surg. 1990 Jun. 19(3):135-8. [Medline]. Raif J, Vardi M, Nahlieli O, Gannot I. An Er:YAG laser endoscopic fiber delivery system for lithotripsy of salivary stones. Lasers Surg Med. 2006 Jul. 38(6):580-7. [Medline]. Seldin HM, Seldin SD, Rakower W. Conservative surgery for the removal of salivary calculi. Oral Surg Oral Med Oral Pathol. 1953 May. 6(5):579-87. [Medline]. Walvekar RR, Bomeli SR, Carrau RL, Schaitkin B. Combined approach technique for the management of large salivary stones. Laryngoscope. 2009 Jun. 119(6):1125-9. [Medline]. Luers JC, Grosheva M, Reifferscheid V, Stenner M, Beutner D. Sialendoscopy for sialolithiasis: early treatment, better outcome. Head Neck. 2012 Apr. 34(4):499-504. [Medline]. Koch M, Zenk J, Iro H. [Diagnostic and interventional sialoscopy in obstructive diseases of the salivary glands]. HNO. 2008 Feb. 56(2):139-44. [Medline]. Marchal F. Sialendoscopy. E Myers, Ed. Salivary Gland Disorders. Berlin, Germany: Springer; 2007. 127-48. Wallace E, Tauzin M, Hagan J, Schaitkin B, Walvekar RR. Management of giant sialoliths: review of the literature and preliminary experience with interventional sialendoscopy. Laryngoscope. 2010 Oct. 120(10):1974-8. [Medline]. Nahlieli O, Baruchin AM. 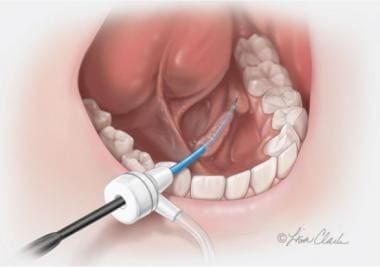 Endoscopic technique for the diagnosis and treatment of obstructive salivary gland diseases. J Oral Maxillofac Surg. 1999 Dec. 57(12):1394-401; discussion 1401-2. [Medline]. Nahlieli O, Baruchin AM. Sialoendoscopy: three years' experience as a diagnostic and treatment modality. J Oral Maxillofac Surg. 1997 Sep. 55(9):912-8;discussion 919-20. [Medline]. Walvekar RR, Carrau RL, Schaitkin B. Sialendoscopy: Minimally invasive approach to the salivary ductal system. Operative Techniques in Otolaryngology. 2009. 20:131-5. Bowen MA, Tauzin M, Kluka EA, Nuss DW, DiLeo M, McWhorter AJ. Diagnostic and interventional sialendoscopy: a preliminary experience. Laryngoscope. 2011 Feb. 121(2):299-303. [Medline]. Marchal F. Sialendoscopy: The Endoscopic Approach to Salivary Gland Ductal Pathologies. Tuttlingen, Germany: Endo-Publishing; 2003. Chossegros C, Guyot L, Richard O, Barki G, Marchal F. A technical improvement in sialendoscopy to enter the salivary ducts. Laryngoscope. 2006 May. 116(5):842-4. [Medline]. Nakayama E, Yuasa K, Beppu M, Kawazu T, Okamura K, Kanda S. Interventional sialendoscopy: a new procedure for noninvasive insertion and a minimally invasive sialolithectomy. J Oral Maxillofac Surg. 2003 Oct. 61(10):1233-6. [Medline]. Capaccio P, Canzi P, Torretta S, Rossi V, Benazzo M, Bossi A, et al. Combined interventional sialendoscopy and intraductal steroid therapy for recurrent sialadenitis in Sjögren's syndrome: Results of a pilot monocentric trial. Clin Otolaryngol. 2017 Jun 5. [Medline]. Kopeć T, Wierzbicka M, Kałużny J, Młodkowska A, Szyfter W. Sialendoscopy and sialendoscopically-assisted operations in the treatment of lithiasis of the submandibular and parotid glands: our experience of 239 cases. Br J Oral Maxillofac Surg. 2016 Sep. 54 (7):767-71. [Medline]. Delagnes EA, Zheng M, Aubin-Pouliot A, Chang JL, Ryan WR. Salivary duct stenosis: Short-term symptom outcomes after sialendoscopy-assisted salivary duct surgery. Laryngoscope. 2017 Dec. 127 (12):2770-2776. [Medline]. Luers JC, Vent J, Beutner D. Methylene blue for easy and safe detection of salivary duct papilla in sialendoscopy. Otolaryngol Head Neck Surg. 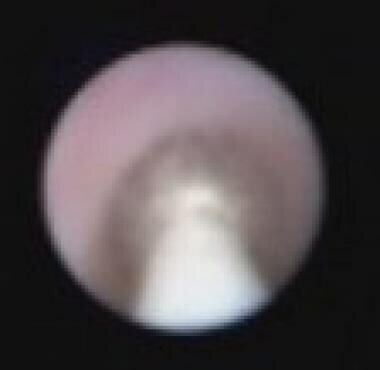 2008 Sep. 139 (3):466-7. [Medline]. Louvrier A, Foletti JM, Guyot L, Chossegros C. [Combined approach of parotid lithiasis. A technical note]. Rev Stomatol Chir Maxillofac Chir Orale. 2015 Jun. 116 (3):139-42. [Medline]. Schwartz N, Hazkani I, Goshen S. Combined approach sialendoscopy for management of submandibular gland sialolithiasis. Am J Otolaryngol. 2015 Sep-Oct. 36 (5):632-5. [Medline]. Serbetci E, Celikoyar MM, Altundag A. Sialendoscopic Pneumatic Lithotripsy for Salivary Calculi: A New Technique and a Long-term Clinical Experience. Otolaryngol Head Neck Surg. 2017 Nov. 157 (5):906-908. [Medline]. Capaccio P, Torretta S, Pignataro L, Koch M. Salivary lithotripsy in the era of sialendoscopy. Acta Otorhinolaryngol Ital. 2017 Apr. 37 (2):113-121. [Medline]. Disclosure: Received royalty from Hood Laboratories for consulting; Received consulting fee from Cook Industries for consulting; Received consulting fee from Medtronic Xomed for consulting. The authors would like to thank Daniel W Nuss, MD, Chairman of the Department of Otolaryngology-Head and Neck Surgery, Louisiana State University School of Medicine in New Orleans, as well as the Department of Otolaryngology at LSU, for their encouragement and support.